Gyrokites small-to-large, single-rotor to high-count multi-rotor gyrokites, gyrokite trains, gyrokite fences, gyrokite nets, gyrokite domes, gyrokite arches, gyrokite meshes, gyrokite trees, gyrokites-in-kite-energy gyrokites, inhabited gyrokites, gyrokite applications, challenges with gyrokites, aerodynamics of gyrokites, costs of gyrokiting, gyrokite plans, groups of gyrokites, AWES gyrokites, gyrokite patents, gyrokite history, kiting phase of launching some gyrogliders, miniature gyrokite systems, large gyrokite systems, gyrokite products, gyrokite events, etc. Tethers, anchors, challenges, applications, safety,design, plans, links, research, events, experience, etc. "unpowered tethered gyroplane"
Distinguish: This group is not for non-kite gyrocopters; powered pods and helicopters are off topic. M33: Tethered autogyro US 5996934 A by Ellis G. Murph. Filed: Nov. 24, 1997. M27: See "Non-Patent Citations" in link of M26. 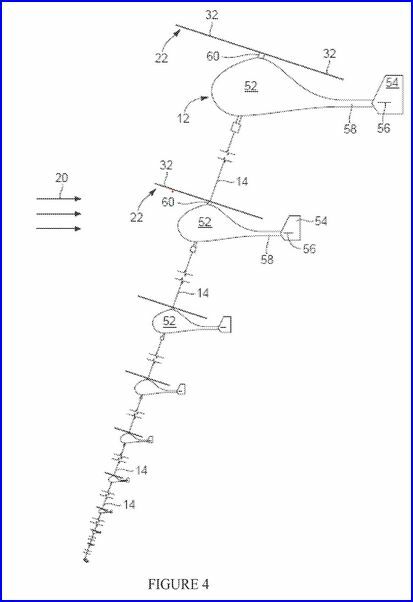 M26: Cited by and Refs: Aerovehicle system including plurality of autogyro assemblies US 8540183 B2 At the page, click on the "Patent Citations" for over 80 patents cited..
M24: Using link of M26, study the patents "Cited by the examiner: "
M22: Helicopters are not gyrokites; however, ...Gyrokites have an opportunity to learn some things from helicopter world, even though helicopters are not gyrokites. Mulling over the whole of helicopter arts, sciences, patents, papers, lessons, safety, etc. will provide items for advancing gyrokiting. M19: RE: Toy-scale gyrokite commercial products. Still photos of a toy gyrokite in flight are invited. Kattas recites "unpowered, tethered model gyroplane" for his kite system. He notices that his instructions apply to arrangements far past his single-rotor preferred embodiment that he uses mostly for illustration in his patent text and drawing. He leads us to tandem and side-by-side multiple rotors. I suppose that staying in the spirit of his instruction, one may explore a global wing system consisting of scores of rotors at once. So, we invite gyrokites with any number of rotors involved in the kite. 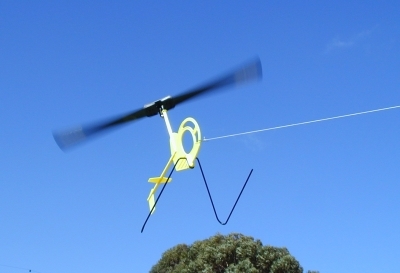 http://www.skywindpower.com/ww/Aust-test.htm for two rotors; when kited as gyrokite, some of the autorotation is mined to make electricity aloft that is sent to a ground load by conducting wires. The same team has been exploring four rotors and special arrangements. Bryan Williams Roberts is studied in part through his patents on rotorcraft, mostly that are aiming for gyrokiting for electricity generation; his rotorcraft are hybrids that helicopter for some part of flight operations and then gyrokite unpowered for generation phases of the flight or for gliding in special circumstances. A distinction note: An autorotating blade set on a kite's wing may be arranged for generation of electricity only and not be involved in the lift system of the kite-system's wing during unpowered kiting; such is exampled by the non-gyrokite of Makani and Joby who use rotors for powered helicoptering and generation, but not for kiting lifting and thus in the main are not gyrokites in the global-system sense. Just having a spinner on a larger wing where the spinner is for decoration or HAWT into apparent wind is not gyrokiting, but important in its own rights. Kattas and Roberts are dealing with gyrokites; Makani and Joby are dealing with non-gyrokites but in such lifting rotors to act as HAWT for generation. So, careful study of Kattas would be needed to see what novelty he brings forward, as considerable gyrokite matter precedes his patent. He did not invent basic gyrokite. So, what novelty claims in Kattas will hold? Open for discussion. M17: Kite. 1891. Thomas Ansboro and John Liddle. Thomas Ansboro assigned half of the patent to John Liddle of same living address. This topic thread invites a special study of the 1891 patent. It seems strongly apparent that Ansboro saw his claims as "improving" the world of revolving kites; if so, just how much was already going on with revolving kites before or contemporary with him? I seek earlier kited windmills, rotor kites, gyrokites. Fig. 2 is a side view of only the "lath" or "strip" that is used to hold the bridle or "belly-band" and the pivoting tube of the rotor assembly and the connection for the kite's tail. The lath or strip could be a stick of wood, but could be other materials. On Fig. 4 drawing, the art misses labeling and showing one of the B' holes that is used to set one corner of one of the three sails. In first view and reading, I missed that he was actually covering most of the large area with a kite covering, saving three special space for a second method of covering. So, he seems to have about 100% solidity of cover, but with three spaces of drooping sail with air outlet. semi-conical pocket D', as shown in Figs. 3 and 4. " The aerodynamics of this kite are on the borderline of "gyrokite" because only a small portion of the kite's lift arrives from the semi-conical sails that funnel air to cause rotation; the rotation direction set up ends up having the base of the triangle sails be the air-release, not crosswinging leading edges. Most of the lift comes from the main covering that turns, but is not providing lift from crosswinding. Revolving occurs, but the kite seems still to be an extremely poor, if at all, gyrokite. Notice that for achieving collapsible kite, he carries lath A and A' which are overlapped or married by tip clips M M; such fixes the two major halves of the wing for flight in "expanded" arrangement. A non-collapsible version of the kite would not need two laths overlapping. The stresses on the pivoting spindle that tie the revolving wing to the bridling lath F will be considerable; bending forces will occur upon gusts, as F will be set by tether and bridle lines while the revolving wing incline gets pushed by a gust to a new position in space. There could be fun in mods to the kite. Consider not globally covering the frame-work while keeping just the three semi-conical sails, perhaps enlarging the sail area of the three loose sails. Consider shaping the laths to airfoil shapes to have the laths become effective long wings themselves. Another mod idea: Consider forgetting the global sail and the loose three sails. Just widen the laths and shape them as airfoils with advanced pitching to get a more advanced gyrokite. My conclusion is that the Ansboro revolving kite gets almost no lift from revolving, but almost all its lift from the tight global covering. I almost do not want to include the kite in "gyrokite" category. M13: RE: SkyMill Energy, Inc. The team SkyWind Power aims to helicopter up and then gyrokite for generation, and so we dedicate a topic thread to study and discuss the company and its technology. Study and discussion is open for this company that uses gyrokites for AWES. "Higher Airborne Wind Energy"
https://www.google.com/patents/WO2011087541A3 Patent is open for study and discussion. Gyroglider power-generation, control apparatus and method CA 2763225 A1 Study how they use the term "gyroglider" with respect to gyrokiting. Discussion is open. This team seems to have a focus on gyrokiting in their AWES. The team is generally in business stealth mode. David Lang has high expertise in tether simulation. A hardware showing occurred in 2009 Chico, CA, High Altitude Wind Power Conference. seems like it will point to some facts on Bensen gyrokites. All are invited to post on the safety of inhabited gyrokites. A live human or more are kited into the air; such is serious matter! Learn from the incidents of others. So, what are the incidents? What lessons may be derived from the incidents. Rules, regulations, guides, checklists, tips, ... ? M8: Safety with uninhabited gyrokites. All are invited to post on safety matters regarding uninhabited gyrokites. M7 Igor Bensen gyrokites. All are invited to help make robust the history of Igor Bensen's gyrokites. This topic invite All to post items that deal with commercial toy-scale gyrokites. Spamming advertising is beyond the purpose of this forum; however concise presentation of facts once on a product is encouraged; then discussion on each product (again without spamming) could be important matter for the development of gyrokites. Finding the first commercialized toy-scale gyrokite would be interesting. Historical products: yes. Contemporary toy-scale gyrokites? and after release for free-flight the system is still a free-flight gyrokite, as then the falling mass of the pilot is the anchor system that falls and tows the gyrokite wing. This gyrokite in gliding mode is a gyrokite glider; some gyrogliders are not gyrokites. a simple, single-seater, autogyro kite with a three-bladed rotor.